But surely one could determine who designed St Lawrence, that unique residential patch of south-east downtown Toronto for which accolades never stop coming. Dave Leblanc described it in the Globe and Mail a few years ago as the “best example of a mixed-income, mixed-use, pedestrian-friendly, sensitively scaled, densely populated community ever built in the province”, and such superlatives are not unusual. Being such a celebrated place, and having been conceived as a coherent whole by a public authority and built on a defined site, perhaps its ‘designers’ can be identified. There are plenty of possible candidates. Alan Littlewood, a British-trained architect employed by the City Housing Department, is usually the first name suggested. But documents from a year prior to his hiring show many of the neighbourhood’s concepts already well developed, prompting one to consider senior city staff in place before him – notably Howard Cohen, Director of Neighbourhood Planning (where the site seems to have been selected), and Michael Dennis, Commissioner of Housing (where the overall concept was hatched). Both had an unmistakable influence, especially Dennis whom more than one participant has said is the most important individual. But he did not lay out the streets or choose the building types. That was the job of a group of city staff (which included Littlewood and the planner Frank Lewinberg), a few design consultants (the architect George Baird’s contribution is well known), and a “working committee” of interested citizens (they were not local residents since the area was uninhabited) chaired by assertive city councillor John Sewell. 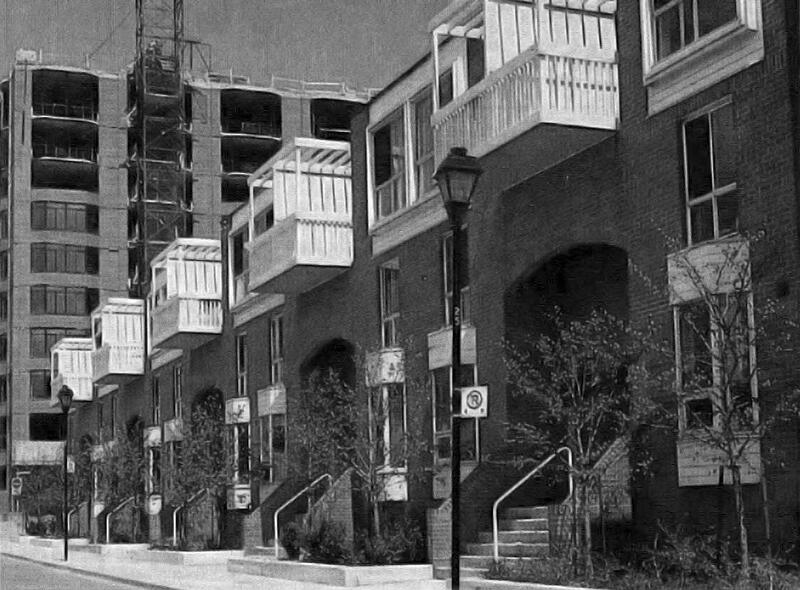 Sewell and his committee seem to have been strong advocates of replicating the city’s late 19th-century residential form with street-facing townhouses in a conventional rectilinear street grid. 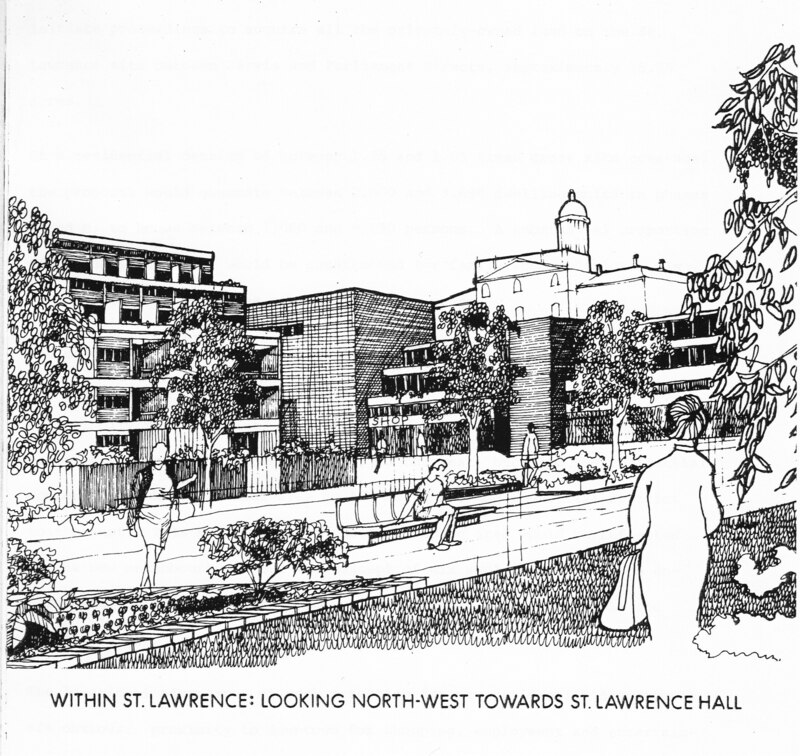 Probably the first depiction of St Lawrence Neighbourhood – a conceptual sketch done by an unnamed person in the City Housing Department, included in that department’s typescript report “St. Lawrence: A New Neighbourhood for Toronto”, 22 May 1974. Then there is Jane Jacobs. She lived in Toronto in the 1970s, and knew Littlewood personally – initially through her husband, who worked at the same architectural firm – and many believe that she somehow transmitted ideas into the project through him. It is hard to completely dismiss this, for they were apparently quite close friends. Who knows what they talked about over dinner? But there is no sign of her having any direct personal influence on the design. Her ideas were in the air at that time, of course, since almost everyone in urban planning and design had read her best-selling Death and Life of American Cities by then (though not Littlewood, until after he began working on St Lawrence), but that is the extent of it. One name that is never mentioned, but should be, is Eb Zeidler. It is curious that his contribution is so under-recognized considering his notoriety, for the evidence is there to see in the Zeidler Partnership’s “Design Guidelines for the Proposed St Lawrence Neighbourhood Site”. The firm was not subsequently retained on the project, so its proposals were never adopted. But several of their recommendations ended up as central features of the neighbourhood, such as using mid-rise residential blocks, and converting the long railway esplanade into a linear park. In the end one cannot say who designed St Lawrence. It was a product of its times, which is to say 1970s Toronto. As one walks its streets today one is witnessing the legacy of numerous important institutions and ideas from that time: a newly-elected reform council and its vigourous new housing department, generous federal government subsidies to housing, a new-found faith in social mixing, disenchantment with conventional urban renewal and public housing, the low-rise/high-density trend in architecture, and the rediscovery of traditional urbanism and inner-city living . Such is the richness of an urban landscape. Much of this piece is based on interviews conducted for my planning history. The ideas here are more fully developed, and sources are cited, in my essay “The St Lawrence Neighbourhood: What it is and Why”, published in Urban Explorations: Environmental Histories of the Toronto Region, L. Anders Sandberg, ed. (L.R. Wilson Institute of Canadian History, 2013). I attempt to downplay Jane Jacobs’s personal impact on Toronto in several publications, the most readily accessible of which is in Journal of Planning History, 10, 2 (May 2011). The Zeidler “Design Guidelines” are in the Toronto Public Library, in a valuable series of reports pertaining to St Lawrence put together by the library. The best overall narrative of the neighbourhood’s creation is the last of that series, written by Michael Dennis, “St Lawrence, 1974-1979”.